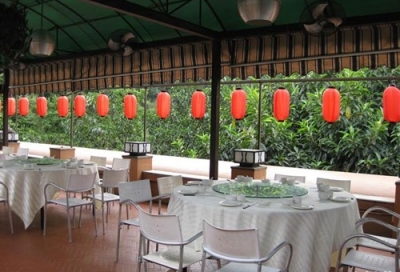 Songfeng Xuan Restaurant is one of a few places where you can literally combine eating and sight-seeing and get good results at both. Located about a forty-minute walk from Mount Baiyun's west gate, their second-floor patio section is surrounded by dense trees and a view of the mountain's rippling hills. Even if you dine indoors, you'll find plenty of greenery, along with a colorful carp pond. Song Feng Xuan's cuisine is thoroughly Cantonese, with chicken, pig's feet and tofu among their most popular items. Dim sum and tea are a morning specialty. Most items here go for about 20 to 90 RMB. **When it's not too busy, Songfeng Xuan Restaurant can send a van to pick you up at the west gate of the mountain. This will allow to enter the park for free, and of course arrive at the restaurant quite a lot faster. Best time to get a seat: Get there before 12 pm for lunch and before 6 pm for dinner. Getting there: Take bus 127, 223, 501, 76A , 885, 265, 36, 38, 76, 891, 265 or 245 to Baiyunshan Ximen (Baiyun mountain west gate) bus stop. Entering the west gate you will see a map showing you how to walk to the restaurant. It may take around 35 minutes.